A deck that is all about utilising the replacement mechanic. It's not a great deck, but it can be a lot of fun to use, especially if you can get multiple Aethermasters on the field, and one of your shenanigan (White Widow, Inquisitor Kron, etc) cards down. 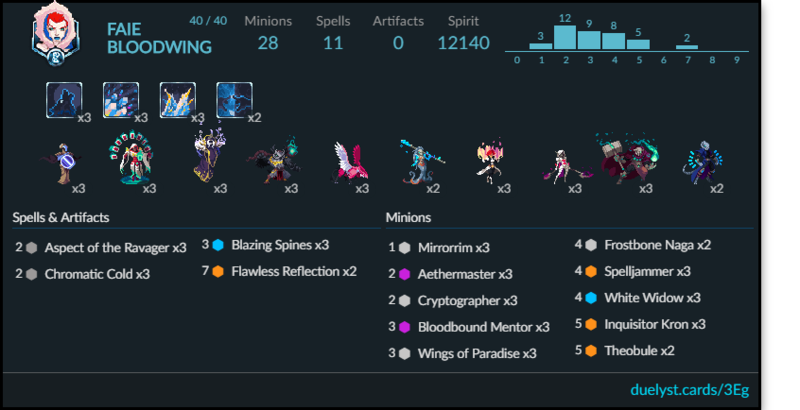 Special thanks to bearhammer for helping me re-imagine this deck! This deck is pretty simple to play. You try to play on curve, dig for Aethermasters, and plop down as many of your replacement effect cards (White Widow, Inquisitor Kron, Bird of Paradise) as you possibly can. Use Mirrorim to adapt your strategy to the situation, whether you feel safe enough to put down more effect cards, or just want to burn them down with Cryptographers and Bloodbound Mentors. Your win condition is White Widow and/or Bird of Paradise, all of your replacements and a Theobule. Keep your hand as full as you can, so that when you play Theobule, it has maximum effect. Either that, or just burn them down. Special thanks to bearhammer for helping me re-imagine this deck! Flawless Reflection is used on Inquisitor Kron’s tokens to make more Inquisitor Krons. Take out Blazing Spines or Frostbone Naga for Luminous Charge, if you want more things to turn into other things. Consider Vanar and Songhai as well for the replace package. Instead of stalling with Sajj you can overwhelm the board or just burn them to death. I’ve actually been messing around with that a lot. It started out as a Magmar deck! What I might do is go for Faie, and put in Bloodbound Mentor, rather than Sojourner. That is basically what I did in MDL and had a lot of fun and some surprise wins.